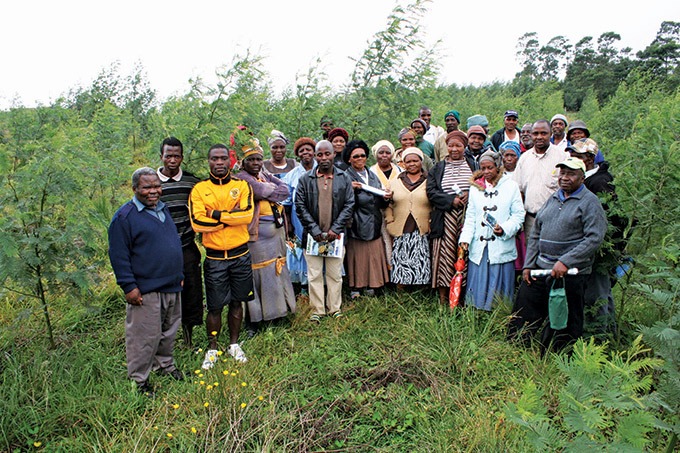 Small-scale tree farmers at Ozwatini … certification of their operations would ensure access to the market and increase the price they get for their timber. 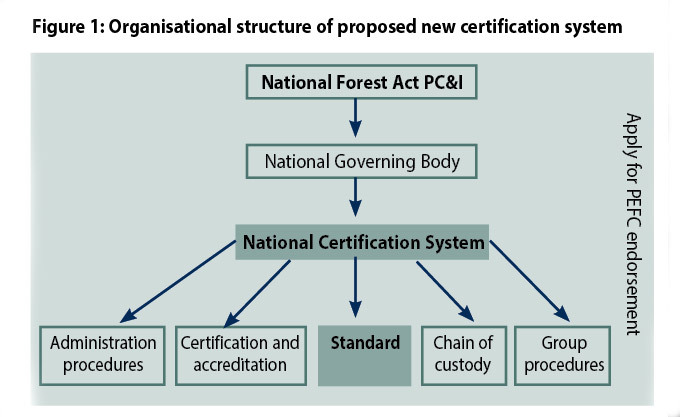 Forestry industry stakeholders have launched an initiative to develop an independent South African certification standard and system that could be endorsed by the Programme for Endorsement of Forest Certification systems (PEFC). The primary objective is to provide timber growers in South Africa with an alternative certification system to FSC that will enable the certification of small-scale timber growers and give them more flexibility and security in the marketplace. A PEFC Steering Committee has been set up as a sub-committee of FSA’s Environmental Committee to develop the system in South Africa. Members of this committee are Craig Norris of NCT, Johan Nel of TWK, Dave Everard of Sappi and independent forestry consultant Steve Germishuizen. The three companies currently driving the initiative, NCT, TWK and Sappi, procure timber from many small-scale timber growers active in South Africa – none of whom have so far been able to get their operations certified despite years of trying. All three companies sell timber and timber products in global markets which are demanding that the timber they buy is certified under one or other of the recognized certification bodies. With more and more timberland in South Africa likely to fall under the control of communities and small-scale growers, it is becoming imperative to come up with a certification system – such as that offered by PEFC – that is more practical and relevant to local conditions. Despite on-going efforts over many years it has not been possible to get small-scale growers in SA certified by FSC, which is more oriented towards European forest management. However all three companies were quick to point out that they plan to retain their FSC certification as some markets will only buy FSC certified timber. In some cases they plan to obtain dual certification with FSC and PEFC. The Environmental Committee of Forestry South Africa (FSA) has tasked the Steering Committee to develop a certification system that could be endorsed by the PEFC. The Committee has suggested using the National PCI&S Framework as a basis for developing an auditable standard. • Establishment of a National Governing Body (NGB) responsible for the governance and administration of the system. This body will include broad stakeholder interests and will oversee the system. (figure 1 below). The NGB will apply to become a member of the PEFC. • Formal approval from government for the use of the National PCI&S Framework for the purpose of developing the standard. • Gazetting of the PCI&S Framework for public use. • Development of an auditable standard using PCI&S Framework as a template. • Development of certification, accreditation and chain of custody procedures. • Development of Group Certification Procedures that will enable Smallholders to achieve certification (risk based certification of landscapes). The PEFC Steering Committee has been given approval to proceed with the development of this system. A target has been set to have a system ready for implementation in the second half of 2017. However, endorsement is only likely to happen in 2018 as the system must be operational before the PEFC will review the system against their standard development requirements. Craig Norris, Manager of Forestry Technology Services at NCT, said the primary objective of setting up a second certification scheme is to manage risk around certification and to develop a system that will enable smallholders to achieve certification. In South Africa there are approximately 1.2 million hectares of exotic tree plantations. About 80% of this area has been certified according to the FSC standards. Most of this certified area is owned or managed by large organisations and there is a growing concern that small and family forestry participants (smallholders) are being left behind with respect to certification. In addition, South Africa’s land reform programme is likely to result in a greater proportion of the plantation estate being managed by smaller scale timber growers. “The complexity and costs of managing plantations under the FSC system precludes many smaller operations from achieving certification. In the future this could lead to a shortage of certified timber to meet market demand,” said Craig. He said that PEFC is more flexible than the FSC in terms of the standard setting process. Craig said that the system could be up and running by the end of this year, by which time an application would be made to PEFC for endorsement, a process that takes around six months. “By mid-2018 we could have PEFC approval and be auditing small growers,” said Craig. Members of the PEFC Steering Committee (from left to right): Craig Norris, Dave Everard and Johan Nel. Sappi, which procures timber from 2 000 small-scale growers who have up until now not been able to get certified, have thrown their weight behind the initiative. “There are two main reasons Sappi feels it essential that we are involved in this initiative,” said Sappi South Africa’s Environment Manager, Dave Everard. “Firstly, having all our eggs in the one FSC basket is risky to the extreme as we will be left with no form of certification should FSC collapse or should they implement standards that are impossible for plantation forestry. South Africa is probably the only relatively significant timber producer from plantations that does not have an alternative certification option to the FSC. He emphasised that Sappi has no intention of dropping FSC certification as some customers prefer FSC certified products. “The approach will be to get all our own plantations dual certified (it should be possible to do this during the same audit), as well as our current group scheme which certifies the larger commercial farmers that are contracted to us. Having PEFC as an option may encourage some of our un-certified growers to join the scheme. “At the same time we will develop a small grower group scheme and get as many small growers certified on the PEFC label as we can,” said Dave. He said that the value of achieving dual certification would be mainly risk management, although one of Sappi’s large customers had recently expressed the need for PEFC certified material – the first such request that Sappi has received. Dave explained that Sappi has already started getting small growers organised and trained. As soon as the South African Forest Assurance Scheme (SAFAS) is up and running, Sappi will get a group scheme certified. According to TWK Agri’s Research and Development Manager, Johan Nel, TWK’s involvement in the initiative is also motivated by the need to spread risk regarding certification, and to set up a system that will be more suitable for certifying small-scale private growers. “PEFC offers more recognition of national and regional standards, and is more plantation oriented,” said Johan. The PEFC was founded in 1999 by national forest organizations from eleven countries in response to the specific requirements for small-and family forest owners. It is designed as an international umbrella organisation providing independent assessment, endorsement and recognition of nationally developed forest certification systems. • PEFC is represented in 43 countries, across six continents (Africa, Asia, Europe, Oceania, N. America & S. America). • A total area of over 300 million hectares certified. • Globally, over a million smaller scale management units have been certified. PEFC has developed a mechanism to enable the independent development of national standards tailored to the political, economic, social, environmental and cultural realities of the respective countries while at the same time ensuring compliance with internationally-accepted requirements and global recognition. • It offers regional, group and individual certification. • International recognition of national systems and mutual recognition between systems. • More emphasis on national standards which ensure requirements are relevant to local conditions. • More pragmatic approach around chemical use. Allows for justified use of chemicals approved by National processes and endorsed at international level. • More relevant to smallholder type operations.